A video resolution converter is highly demanded to change resolution of a video file, e.g. from 4k to 1080p, 720p to 480p, so as to improve compatibility with portable devices. For instance, when you try to put a video with a resolution of 1280x720 into your iPhone X/8/8 Plus featuring a 1334x750 display, you will notice the black bars on both sides during playing, which ruins your visual experience. So you have to rely on a video resolution converter to decrease video resolution from 1280x720 to 640x480 for better playback or upscale video resolution from HD to 4K UHD for 4K TVs or 4k-supported streaming sites. MacX Video Converter Pro can change video resolution from 1280x720 to 640x480, 4k to 1080p, 320x240 to 720X480, and even upscale HD 1080p to 2K/4K UHD, etc for iPhone, iPad, YouTube. Also an aspect ratio converter, video compressor and YouTube downloader. Before introducing the step-by-step tutorial to freely change video resolution for each file, let's go a step further and learn more about the specific video resolution as per your needs. The mobile devices have a specific requirement for video resolution. At the same time, the high-quality video featuring higher resolution in 1080p or 720p, though delivering crisper image, engulfs a large amount of storage space of your iPhone iPad. 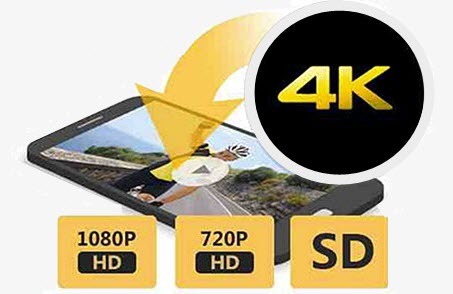 For better HD video playback on iPhone, iPad, Android or other gadgets without taking too much space, you need to reduce the resolution of HD video from 1280x720 to 640x480, 1280x720 to 720x480, etc. This is also a good practice to compress video, e.g. from 4k to 1080p, 1080p to 720p. * Best video resolution for Microsoft WP8, Xbox, Surface, Zune: 720x480, 320x240. The popularity of burning video to DVD for preservation spawns the increasing need of a video resolution converter. For example, if you've saved some low-resolution videos, you need to increase the video resolution, e.g. from 320x240 to 720x480. This is because the DVD standard asks for the video resolution no less than 720x480. See how to convert MP4 to DVD. Note: It's common to downscale video resolution but rare to upscale video resolution, since increasing the resolution of a video doesn't improve the image quality but enlarges the video file size. * Best video resolution for DVD burning: 720x480. *	Recommended resolution for YouTube uploading: 3840x2160, 2560x1440, 1920x1080, 1280x720, 854x480, 640x360 and 426x240. 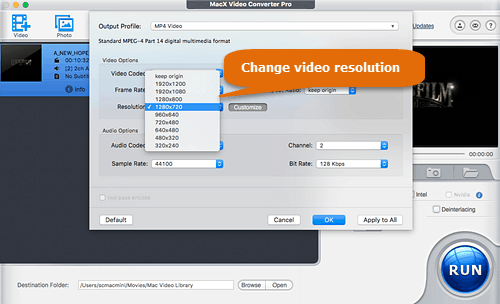 To change resolution of video files without losing too much quality, you can rely on a video resolution converter such as MacX Video Converter Pro. It's not only a video converter for Mac and Windows that transcodes between SD and HD videos, like MOV to MP4, AVI to MP4, MKV to AVI, YouTube to MP3, etc, but also a video resolution converter, aspect ratio converter, etc that allow you to adjust the video resolution from 3840x2160 to 1920x1080, 1280x720 to 640x480, 1280x720 to 720×480, 1920x1080 to 640x480, change aspect ratio from 4:3 to 16:9, and even change video bit rate or codec to enhance the video quality. You can follow the step-by-step guide to learn how to change video resolution, e.g. for playing on iPhone X/8/7. Step 1: Free download the video resolution converter for Windows. Or check the Mac version if need to convert video resolution on Mac. Step 2: Click the +video button to load your video. Batch converting is supported. Step 3: Choose the output video format as you need. The video resolution converter offers 420+ readymade profiles for almost all devices. You can directly choose the specific device profile and never mind the video resolution as the profile offers the best video resolution, codec, bit rate, etc that give you great viewing experience even if you are a newbie. If you only need to change video resolution, please jump to step 4. Step 4: Since iPhone X/8/7 supports video with 640x480 resolution, go to the icon on the main interface -> go to resolution from the drop-down window -> simple choose the 640x480 option. Certainly, you can also convert video resolution to 1920x1080p, 1280x800p, 320x240, etc as per your need. Step 5: After all the settings are finished, just click RUN button and begin to convert video resolution. It will take a few minutes to finish the task. Video resolution goes hand in hand with aspect ratio. Or else, you will get black bars during playing. E.g. please change aspect ratio from 16:9 to 4:3 if you convert video resolution from 1920x1080 to 640x480. Video resolution is usually regarded as width and height in pixels. For instance, the 1080x720 means the width is 1080 pixels and the height is 720 pixels. There are 3 main types of video resolution nowadays. 1. SD: also known as standard definition. The most popular SD resolution is 640x360 or 640x480. 2. HD: also known as high definition. There are two main HD video resolutions: 1280x720 and 1920x1080. The former is also called HD Ready for television channel broadcasting and DVD burning, while the latter refers to Full HD for HDTV high definition video with a widescreen aspect ratio of 16:9. 3. 4K: 4K has a resolution of 4096x2160 pixels or 3840x2160 pixels. Right now, YouTube supports uploading 4K videos while iPhone 7 also supports 4k video recording. So you can download 4k videos with ease. It will definitely become the mainstream standard for distribution. But 4k video is huge in file size. Many mobile users are prone to be out of space and want to change video resolution from 4k to 1080p for less storage occupation. Free download the best video resolution processing program - MacX Video Converter Pro to transcode between SD and HD videos, adjust the video resolution from 3840x2160 to 1920x1080, 1280x720 to 640x480, 1280x720 to 720×480, 1920x1080 to 640x480, etc to enhance video quality or lower storage space.